Idea of the Day: Terrarium Necklace. Tiny Terrarium Necklace by ecouterre. 19 Handmade Gifts for Women and Older Girls…. with Tutorials. 1. Chalkboard Necklaces by Henry Happened. 3. Twig Necklace by henry Happened. 4. Sewing Kit in a Jar by Martha Stewart. 5. Paper Clip Earrings by Evie-S.
6. Recycled Woven Rug by Craft Passion. 7. Fold-over bag by Noodlehead. 8. Little Letter needle Book by Emaykayee. 9. Silhouette Jewellery by Less than Perfect Bliss. 10. Feather Hair-clips by Henry Happened. 11. Clay Necklace by Henry Happened. 12. Embellished Resin Rings by Tatertots and jello. 13. Beach Towel Tote by Redefining Creativity. 14. Swatch Portraits by Purl bee. 15. Vintage hankie Pillow Cover by Noodle Head. 16. 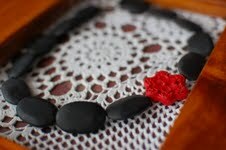 Fabric Beaded Jewellery by Make It and Love It. 17. Dip Died Scarf by Henry Happened. 18. Love letter Corsage by Less Than Perfect Life Of Bliss. 19. Confetti Earrings by Evie-S.
hd: Tell us a little about yourself…. ba: I really like drawing and writing and making creative things like jewellery. I also like looking at pretty and cute things. I like elephants and dogs most of all. I am one of a family of 6. I attend Dulwich High School of Visual Arts and Design and I am 13 years old. hd: Usually I ask …..What did you think you would be doing when you were in school? ba: Well, seeing as I am still in school, the thing I most hope to be doing when I leave would be getting a job as a manga artist/graphic novelist. I also thought that I could go on an overseas trip to Japan when I am older to hang out with the artists there. I am learning Japanese and am at an art school, so I am happy with how things are heading. hd: So how did you start making jewellery? ba: My Mum is a creative person and I inherited her creative genes. My head keeps filling with ideas I just have to try….unfortunately some fail but there is always another one which pops up sooner or later. ba: Simple pretty friendship necklaces for older girls or sisters or Mother’s and daughters. I have made them so that when you are not wearing it you can display it on a special shelf to enjoy all the time rather than be hidden away in a jewellery box and forgotten about. The bottles are vintage glass which have lasted this long so I am sure they will last a long time. The glass is quite thick. 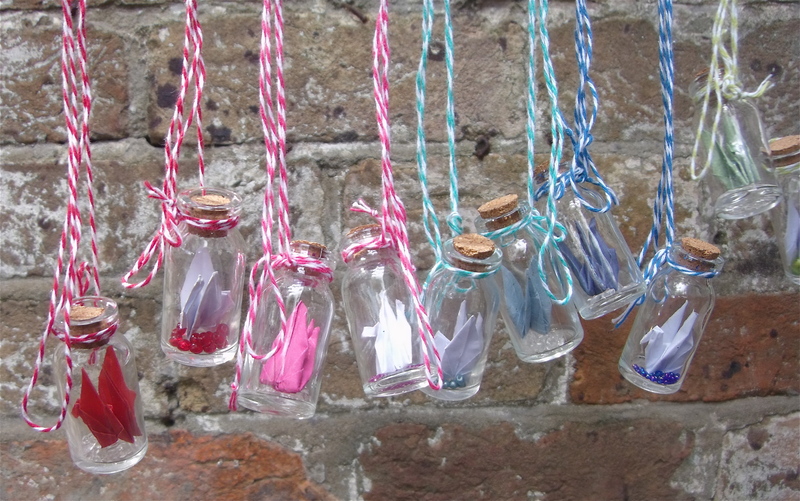 Inside is a tiny folded white origami bird and contrasting coloured seed beads. The other has a bird the same colour as the beads (in the other one) and clear beads…. look at the pictures and you will understand what I mean. Co-ordinating bakers twine is used to hang the bottle around the neck. Often you see friendship necklaces/bracelets for little girls but what I have made is a friendship necklace that is a bit more grown up that teenagers and adults are happy to wear. hd: What a fabulous idea! Have you always loved jewellery? What is it about it that captured your attention and started you making? ba: It’s kind of limitless. There are the ‘guidelines’ for example necklace, brooch, bracelet etc but really you are only limited by your imagination and by what someone is willing to wear. hd: So, what did that first sale feel like? hd: Of course the answer was yes and you have kept making beautiful things. What are you offering the harrysdesk readers? ba: Anyone who purchases a necklace set (2 necklaces) at my etsy store PLUMAGE can use the code BLISSBOMB to purchase it for $20 (including postage to anywhere in the world). Normally this would be $30. Please be quick as I only have seven sets available ….at the moment. I don’t think I will be able to make any more before Christmas. * if you make things and would like to offer something special to harrysdesk readers. Please email me. 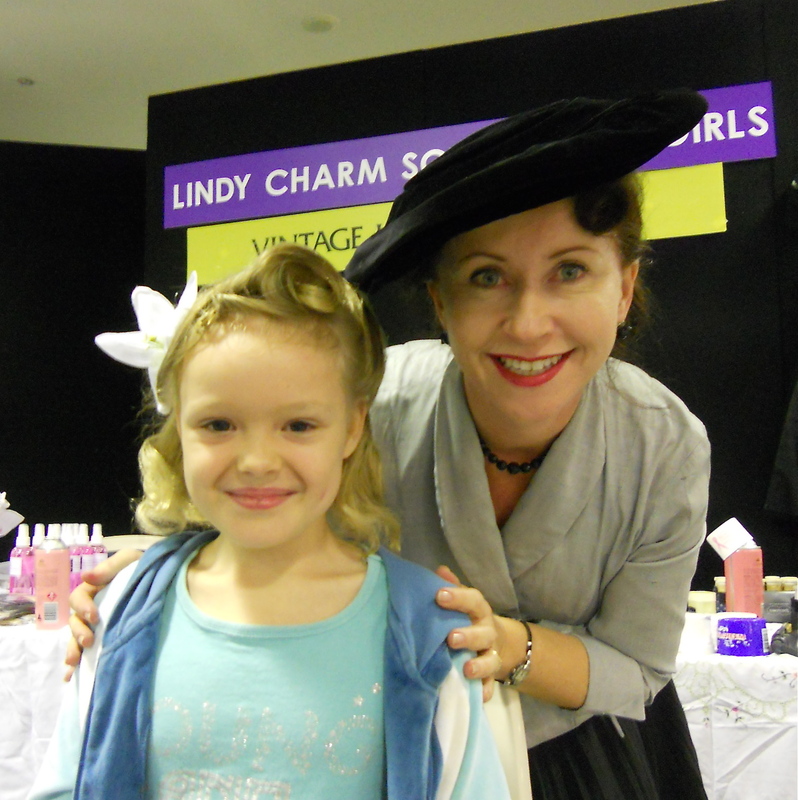 Today 7 year old and myself had some very vintage girlie time at the Vintage Textile Show at Canterbury Race Course. Thanks Caroline for letting us know about it. We had a lovely time looking at dresses, fabrics and jewellery from across the past century. The highlights of the day for her were buying some new knitting needles. 3 pairs! 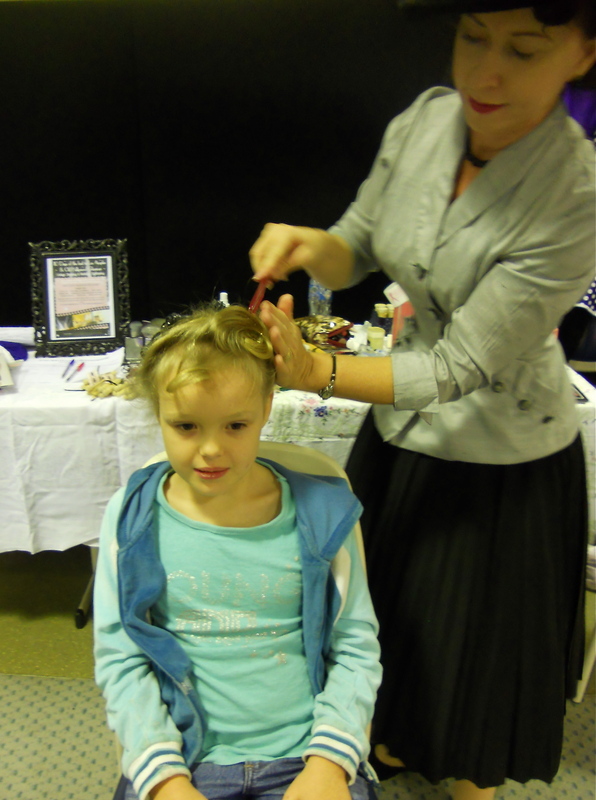 …and having her hair done, 1930’s style. I just had a lovely time hanging out with her… and the textiles weren’t bad either. sh: hmmm… well, I’m currently a stay at home Mom with two gorgeous girlies who both keep me very busy! I love being a mummy and am really grateful for the opportunity to stay home with them (most days!) I love creating, op-shopping, baking, cooking, friends, good coffee, lazy sundays & photography! hd: What did you think you would be doing when you were in school? sh: A pilot… my dad seemed to have so much fun being one, I thought it would be a great job. hd: So how did you move from wanting to be a pilot, to making beautiful jewelery? sh: I’ve always loved being creative & enjoying doing crafts & sewing. I think my mum really nurtured this in me – doing lots of cross-stitch, crafts, sewing & knitting when I was younger (I still have a beautiful bear – a project one school holiday). During high school I made quite a few of my own clothes – my favourite was a skirt made of ties! I took a hiatus from doing much creating after I finished high school till my daughter turned up! Suddenly I had all this spare time & lots of nights staying at home so I started to make some jewellery for myself! hd: I would love to see your tie skirt! What is it about jewellery that captured your attention and started you down the path of making it over the other things you just mentioned? sh: I’ve always loved different, unique jewellery. So I guess that comes across in the items I make. I have a short attention span, I love to get a result fairly quickly so I guess that’s one of the things that appealed to me about jewellery. hd: Describe your first sale? sh: AMAZING! I couldn’t believe that someone I didn’t know wanted to buy something I had designed and created. I’d sold lots of jewellery to family and friends before that first “stranger” sale, but I kinda always believed they did it just because they knew me. hd: As the first ‘Friends of harrysdesk’ bliss–bombs for the year, what are you offering us? sh: I would love to offer Harrysdesk friends 15% off the total of any purchase for the next 2 weeks! 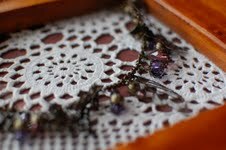 You can find my items at my Madeit store or in my Facebook sale album. Just mention the harrysdesk bliss-bombs when you purchase an item and get a discount!